The EdTech industry continues to grow with new products. 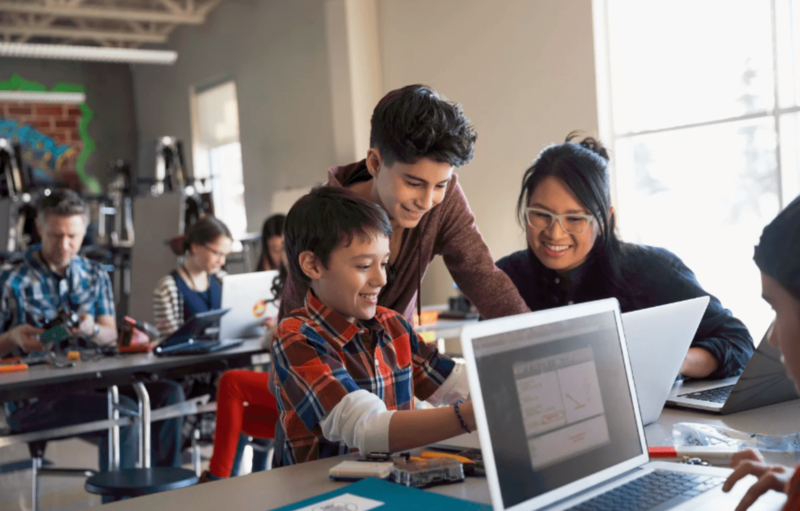 These edtech products are available to educators and school administrators. Each one can make a big difference in your teaching and your students learning. They can choose a layout and insert Google images straight from the app into locked panels. They also have the option to create a book from scratch. They can customize the font, add shapes and stickers, hyperlink the text to other online resources, and import audio and video files. Once the book is ready to publish, the pages turn like a real book with audio and video options inside the app. It’s also an app perfect for teachers. They can create books and put them in a private library or a shared library for you and your students. Introducing this new tool to your students can open up great opportunities for learning. Turn any page on the internet into a lesson with the Insert Learning tool. Teachers can add some questions and add a few commentaries while inserting a related video. You can do all that with Insert Learning. It’s basically an extension you can add to your Chrome browser. Once done, you can turn a web page into a lesson in just minutes. Highlighting text, adding notes, and embedding your own questions can all be done using Insert Learning. Other content like YouTube videos, ThingLink images, flashcards from Quizlet, mind maps from Coggle, even videos you record straight from your webcam can also be included in your lesson. It doesn’t stop there! You can also grade your students right inside the app with a special code through Google Classroom. Your students’ responses will be sent to a teacher dashboard. This tool is great for engaging your students with dynamic lessons. Don’t be afraid to experiment with tools to see what works and what doesn’t. Flipgrid is an app where teachers or students can pose a question and prompt others to answer it using short videos. Once the video is finished, they can also leave a response to other videos. If you are doing a book review or a film review in class, this would be the perfect tool. Flipgrid is the leading video discussion platform used by millions of PreK to Ph.D. educators, students, families, and organizations in more than 150 countries! Create a Grid (that’s your classroom or group), add Topics to spark the discussion, and your community builds a dialogue as they share short video responses. This app is perfect for social studies and history teachers. It is an online collection of primary sources, news artifacts, and lessons that help teachers teach media literacy, civics, and all aspects of the First Amendment. This gives your students a closer look at history. You can search for content several ways. You can try it by state, century, theme, topic or type of resource. There are various forms of content as well: map, a newspaper, a quiz. You can share it using a URL which can last for weeks. This app must be on every history teacher’s list. This tool guesses what you’re trying to draw. It’s a cool app to begin some sketching. It gives you a strip of illustrated images to choose from, based on the object you’re trying to draw. You can choose that object, add color, resize it, or basically manipulate it however you want. You can also turn OFF the automatic feature and just sketch without any assistance. Once complete, you can download it as a PNG file, share it on your social media. Autodraw is perfect for dual coding, visualization, and non-linguistic representation when teaching. Teachers can use this app to add icons or illustrations to your classroom materials. Some teachers also use this for early finishers in their class. You can also recommend it to students to assist them when they’re trying to create projects. Quizalize aims to make quizzes a form of friendly online competition. Teachers can create quizzes that test subject knowledge or can pick from a selection of 20,000 premade quizzes. Then, students can be grouped into teams, play as individuals at home, or sit down to a formal test offered through this tool. Make Newsletters, Presentations, and other forms of Communications with Sway. Powered by Microsoft, you start by selecting a template, a topic, or a document you already have on your computer. You can insert images and videos inserted, forms added, and content embedded. Then you can add content without toggling between tabs. Easily drop in photos, videos, and other multimedia. Note that Sway is integrated with your device and the web. It’s a good alternative to Powerpoint when making presentations in class. Edmodo is a platform where parents, students, and teachers, where they can all be involved in education. Designed by the National Council of Teachers of Mathematics (NCTM), Illumination provides teachers with a platform where they can find hundreds of lesson plans, activities and ways to improve their teaching practices. Educators can pick grade specific games and content, ensuring that their students are on par with standards set by the NCTM. This EdTech tool is so easy to use. It gives both students and teachers a space to create interactive presentations. Teachers can use this to upload unique content. Students can produce mind maps, comic book strips, and presentation with audio, and visual qualities. Next How to use ‘Green Screen’ / ‘Chroma Key’ tech to look inside the human body! Thank you for sharing this wonderful information about Top 10 EdTech tools. You guys should also check out this Free EdTech tool – Animaker Edify https://edify.animaker.com/ As a teacher I find this tool to be so helpful for creating curriculum lessons using animated videos and Infographics. It’s DIY and doesn’t eat much of my time! Allows me to add students and share these lessons with them. You can also assign creative tasks which improves the creativity quotient and teamwork among students. After introducing this tool my students just love the class and are highly engaged! ​​Hypersay is a platform for interactive presentations that massively increase engagement. Keep your audience engaged with polls, questions, private notes and live slide sharing. Store, enrich & deliver presentations from your cloud.